UNITED NATIONS, March 22 -- The day after Russian Ambassador Vitaly Churkin chastised a Western Security Council member's spokesman for offering “distortions” to the media without waiting for the President of the Council to speak first, the predictions were of more attacks and tensions in and around the Council. A Council member's Permanent Representative told Inner City Press, explicitly “on background,” that Churkin has been making three critiques. First, that there are too many people in the Council's closed door consultation room, some of whom are “leaking.” (This is a critique other Council sources say that the US Permanent Representative Susan Rice has echoed, urging more junior diplomats of Council members not to give information to the press). Second, he said, Churkin has complained about Western countries' spokespeople spinning the media, on an anonymous basis. Russia's spokesman Anton Uspensky rarely joins this gaggle: Inner City Press has suggested that might be a better approach. Third and the only one of the three that Churkin expressed to Inner City Press when asked, the so called “Quiet Room” is not quiet enough. 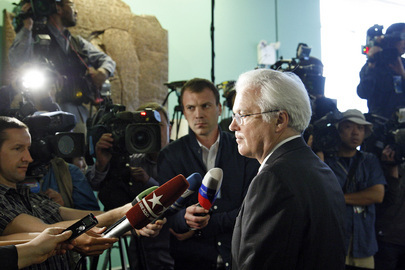 “There are people laughing,” Churkin told Inner City Press. It is a waiting room where non-Council member states can wait and lobby. But during these Libya meetings, Ambassadors from all over the world stop it, and it can get loud. During three March 21 stakeouts about Sudan, the speakers' remarks were routinely drowned out by unrelated loud and plaintive questions shouted from the other side of the stairs. French Ambassador Gerard Araud was asked, loudly, why the African Union could not fly into Libya. “There is no mechanism, Madame,” Araud answered. And what mechanism is there for adjudging Churkin's claims, either the one he's made public, or the anti-leaking one he's said to share with Susan Rice? Watch this site.